You guys. 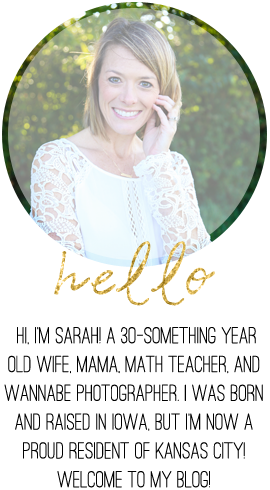 In 15 days, I will have a five year old! Five! I'll save the sappy stuff for later, but for now, Brantley's birthday wishlist! Zingo Sight Words - Brantley has enjoyed playing Zingo (the original version) since a very young age. I can't think of a better way to start teaching sight words! Eric Carle Mini Book Set - For some reason, Brantley was fascinated to know that Eric Carle has written a number of the books we own! As a result, he loves grouping all of our Eric Carle books together and he especially loves reading them. May as well add to our collection! Batting Helmet - Apparently, baseball around here goes from fun to serious in no time! Like, kids pretty much need to have a team by first grade or they get left in the dust. Or so I've heard. Anyway, Brantley's in his third season of t-ball and Craig thinks it would be fun to get him his own batting helmet. You're in charge of this one, Daddy! Melissa & Doug Smarty Pants Kindergarten Card Set - Brantley loves to learn and loves to impress us with his knowledge (mostly math). Never to soon to start prepping him for school! Doodle Activity Book - This book is full of doodling activities. And we have a long drive to Florida coming just a day after his birthday. Melissa & Doug See & Spell - Lately, I'm all about the "toys" that are educational. Can you tell? I actually bought this at Christmastime and I've been saving it ever since! I'm just proud of myself for remembering! Charlie Hustle KC Heart Tee - Time to upgrade to the next size! Pogo Jumper - There was an old school pogo stick at daycare that Brantley just loved. I'm sure this isn't anywhere near as cool as the vintage version, but it does have great reviews! Any other ideas for a soon-to-be five year old?! Such great birthday ideas! We love the original Zingo, so this one would be a hit too. I need to think of things for Cam. Can you even believe you'll have a 5 year old going into Kindergarten?! Time sure does fly! Dragon's love Tacos 2 is on my book wishlist lol. I put the pogo jumper in Wesley's Easter basket! It's so fun and I love that even I can use it! That pogo jumper would totally cause a broken bone in this house hahah! We have Dragons Love Tacos 1 and 2 and LOVE them!!! We have that Zingo game and Mason is OBSESSED! I have a Zingo game on his bday wish list as well! And also that Dragons Love Tacos 2. We also have that see and spell game and Mason loves it! I need to make his bday wish list soon and add a couple of your recs! Five hit me really hard. Like, I was a weepy mess a few days leading to Marcus' birthday. We have the original version of Zingo, and totally want to add the sight words to our game collection! We're also in need of Dragons Love Tacos 2 and a new CH shirt! 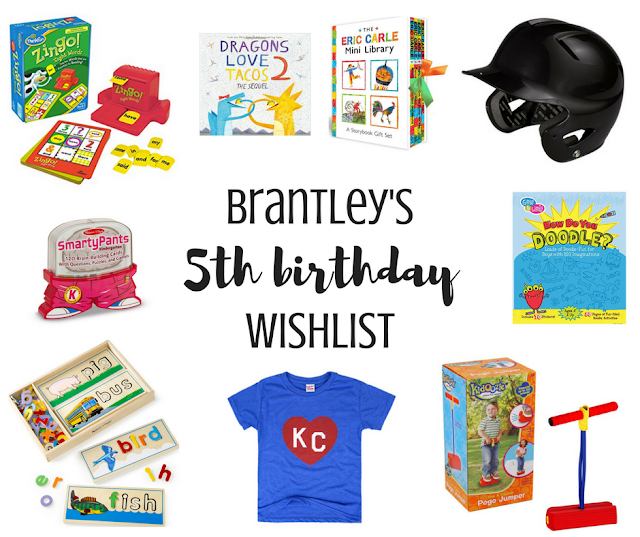 I hope Brantley receives all these fun goodies! I keep seeing zingo around! It looks like a fun kid game.